But let’s face it, only computer scientists can get really passionate about the world’s biggest database. We don’t evaluate the food we eat based on metrics (although we’d likely be healthier if we did). Do I want it? Do I love it? How does it make me feel? 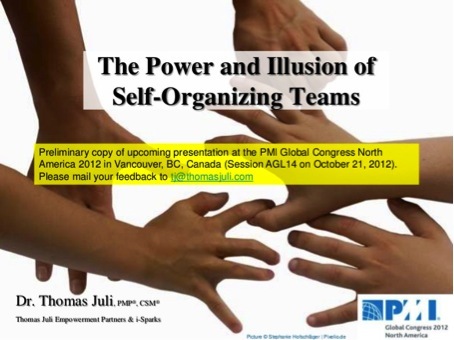 The final version of my presentation of “The Power and Illusion of Self-Organizing Teams” held at the PMI Global Congress North America 2012 on October 21, 2012 in Vancouver is now availalbe for free download. Please let me know if you would like to receive the original file of the presentation which I would make available under the Creative Commons agreement. Zen has been, is and most likely always will be one of the most influential, inspiring philosophies, perspectives of life. Self-organizing teams on the other side seem to be a rather modern phenomenon, some people believe. 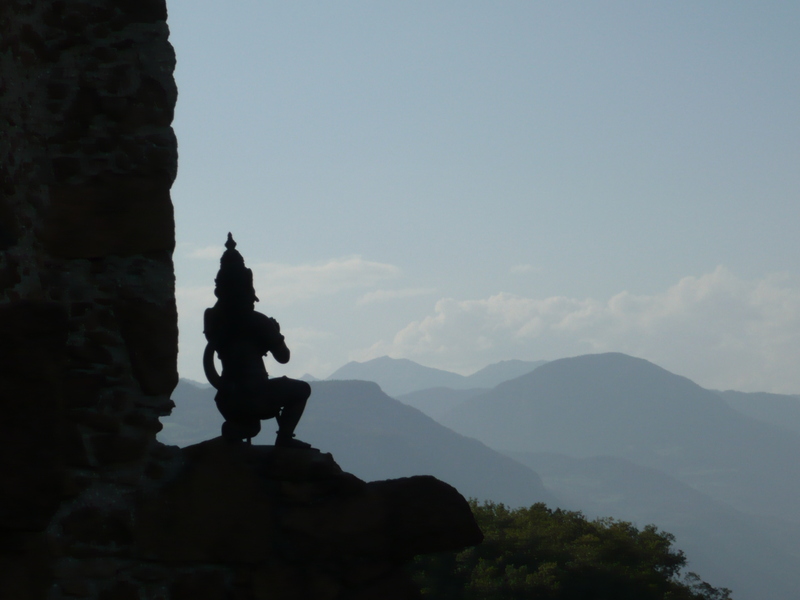 What does Zen and self-organizing teams have in common?. Well, I don’t want to answer this question in depth at this time. However, what I can offer are two presentations I have uploaded to Slideshare.net which deal with Zen and Self-Organizing Teams. Today’s projects become increasingly complex and a test of our leadership. The question is how we can master this increasing complexity? 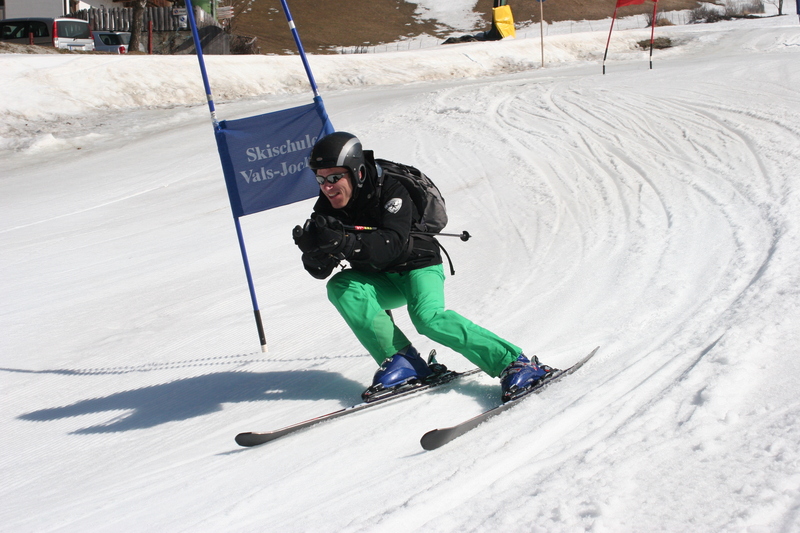 Individuals in the team and the whole team need orientation and guidance or an inspiration how to do so by themselves. Personally, I have found that the philosophy of Zen offers many insights which can help us achieves this. 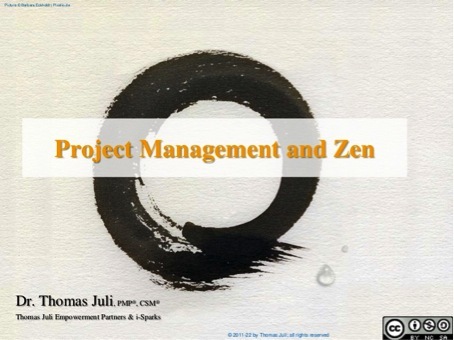 This presentation introduces 10 Zen insights and translates them into the language of project management. It shows how to apply Zen insights in a project setting. Zen can help inspire us personally and how to interact effectively with our team, customers and stakeholders. Applying Zen in projects makes it easier to build teams, perform on a high level and deliver results which delight our customers and teams alike. It thus helps us and the team to evolve into a performing unit and excel. Note: I have published this presentation under the Creative Commons agreement which allows you download the PPT-file for free and re-use it for your own purposes as long as you acknowledge the copyrights. Teams and teamwork are the heart and soul of every project. This is especially true for agile teams. It is not the individual performance or accomplishment that counts but that of the team. Just like in team sports the team succeeds and fails together. The Agile Manifesto puts the team at the center of interaction. It states, “The best architectures, requirements, and designs emerge from self-organizing teams.” But what does “self-organizing” mean? Does “self-organizing” mean that team building is no longer necessary and that instead the teams do this by themselves? And, if teams are self-organizing why do so many teams and projects still fail? I will give this presentation at the PMI Global Congress North America 2012 on October 21, 2012 in Vancouver, BC, Canada. This fall I will be answering these and other related questions at the PMI Global Congress North America in Vancouver. My whitepaper and preliminary Power Point presentation are now available for free download. I am curious about your experiences with self-organizing teams. Please share your thoughts and insights. 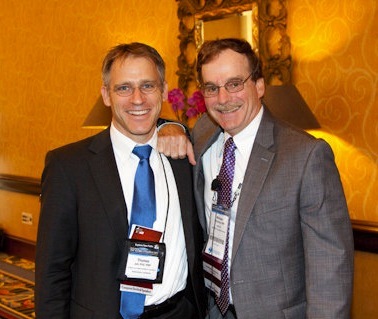 This is the third part of my impressions of the 2011 PMI Global Congress North America in Dallas. Part 1 talks about the conference setup. Part 2 covers my lessons learned from sessions on sustainability, ethics, innovation, and Agile. In this 3rd part I am talking about my takeaways from sessions about Leadership, Project Winners, the Learning Project Organization, and the future PMO. Happy reading! Slides of my own session “SFT02 – The 5 Team Leadership Principles for Project Success – Part of Leadership Community Track” are available for download as well as on Slideshare. Both Links are available on my blog. What else can I say about any of Michael’s sessions? You have to attend them. They are and Michael is AWESOME. Servant leadership: how can I help? What can I do to help? Peter Taylor explains why we should think of us as superstars. Why? Because project management is – or shall we say, ought to be – more prevalent than most of think. Slides of my second presentation “ISS13 – The Learning Project Organization – Part of Learning, Education & Development Community Track” can be downloaded from my blog at or viewed on Slideshare. What I have said about Michael O’Brochta applies to Jack Duggal, too. His sessions fall in the category “Must attend”. In Dallas Jack talked about “Reinventing the PMO for the Next Decade”. A high degree of compliance (80% and more) to project management processes did not correlate to project success, according to a recent study by Jack Duggal. Bob Dylan: If you are not busy being born, you are busy dying. … what about the other sessions? There were so many sessions I wanted to attend. Often it has been very difficult to make a choice. Luckily there are papers and presentations to download from the Congress’ websites. Oh yes, there will be many Congresses to come. And I hope that I too can participate in them. So, tell me and all other readers what you have experienced in Dallas. What were your highlights? What did you miss? And what did you take away from the Congress? 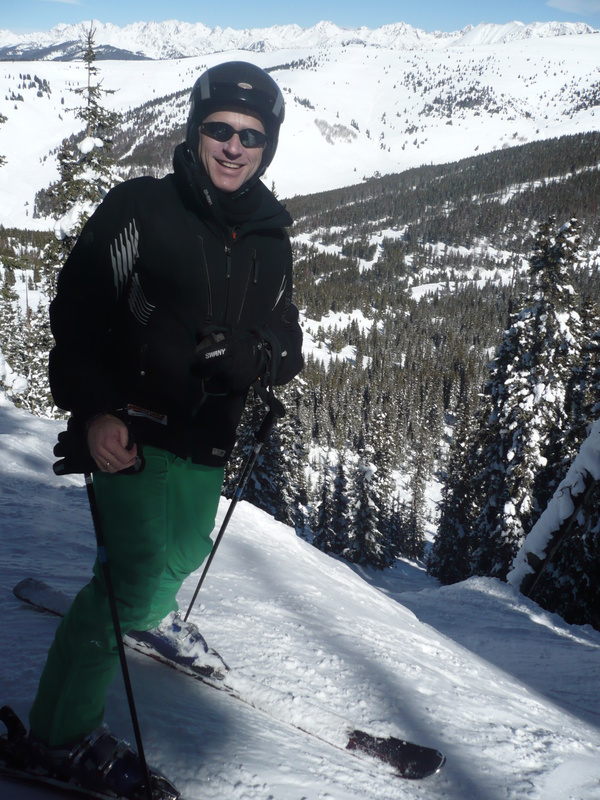 This is the second part of my impressions of the 2011 PMI Global Congress North America in Dallas. Part 1 talks about the conference setup. You can read it here. In this second part I am talking about my takeaways from the sessions I attended. In other words, what have I learned? On Saturday Oct 21 I attended the day-long research workshop “Sustainability and Project Management”. It was a good mix of lecture, workshop / breakouts, discussions. If you prefer smaller crowds and like interactive sessions, these research workshops can be very good choice. My own expectations were met. Alas, it would have been nice if reading material would have been made available prior to the Congress. Something PMI and future hosts should seriously consider. Corporations will not survive without embracing sustainability. Corporate Social Responsibility (CSR) is a source of opportunity, innovation, and competitive advantage. It hence makes holistic rather than one-dimensional investment analysis mandatory. Accounting for sustainability principles ensures a holistic project setup. Frame projects as learning opportunities. Benefits of considering sustainability principles: cope with the complexity and dynamics of projects. Investing in sustainability means having greater flexibility and more options in the future. Sustainability is about effective project management and opportunities. Understanding the project goals the desired sustainable outcomes forces innovation and out of the box thinking. Sustainability requires a holistic management and leadership approach. This session was a pleasant surprise. Not only was the content really valuable, the structure of the session was wonderful, involved attendants from the very beginning. After a few Pecha-Kucha style presentations (3-5 minutes each) the audience split into 4 groups discussing how to improve applying the code of ethics (1) responsibility, 2) honesty, 3) fairness, 4) respect) in our everyday project life. Each group discussed the various codes for 5 minutes, then moved on to the next topic. The session concluded with the presentation of the group discussions. This session was exceptionally well prepared. It proves that you can interact even with a big audience and get a lot out of 75 minutes. Congrats! You will attract more with honey than will vinegar. Hence, lead through your own positive example. Saying what you mean and meaning what you say = integrity. Opposite of professional conduct? An empty suit. Excellent keynote if you are interested in innovation in your project environment. I loved it. You have to understand the social dimension of technology. Innovation is a mass phenomenon and not an elite one. We privilege resources too much. Innovative tweakers take someone else’s ideas and turn them into money makers. Perfect example: Google. Want to learn more of what I am thinking and doing about innovation? – Visit and follow www.i-sparks.com. Very good session. It was hands-on. The speakers did not elaborate on abstract theories but covered what matters in day-to-day work when you are working with and for virtual teams in an agile setting. The best architecture, requirements and design emerge from self-organizing teams. However, even self-organizing teams still need a strategic decision. Boy, let me tell you Jesse does understand and live Agile. He is the person to go to if you have any questions about Agile. Excellent session! Thank you, Jesse, for sharing your experience. Part III of my impressions and take-aways coming soon. Topics will include leadership, the lazy project manager, the learning project organization, the future PMO, and upcoming conferences. Stay tuned! It was a crystal-clear mission. Thought the management. Develop and launch a new software product. The project objectives were defined and announced. It was not the first time the various teams from product development, software development, IT operations, marketing and sales faced a challenge this big. After all, processes were defined and worked in the past. Still, this time things were different. Given that product requirements were permanently in a flux and management wanted to have the flexibility to react to changing market demands all team teams agreed to embrace an agile approach to product development. That is, software was planned to be rolled out every 2-3 weeks rather than at the end of the project in a big bang. Dedicated teams were formed, regular stand-up meetings to synchronize the teams were set up. From an organizational point of view things were well prepared. And yet, things did not quite work out as planned: Software could not be rolled out every other week because the various teams did not synchronize their efforts across teams. There was a widening gap between the functional teams, i.e., between the requirements side, the software development teams, marketing, sales and IT Ops. Information was not openly shared and got lost in translation between teams and organizations. While some teams applied Scrum for software development, IT operations and other software development teams favored a sequential waterfall approach and blocked all agile efforts. In consequence, gained productivity gains from agile teams evaporated in conjunction with non-agile teams. In addition, there was disagreement about what would happen after the product launch. There were a number of reasons for the suboptimal outcome. Project objectives were clearly defined at the beginning of the project. Alas, some project objectives competed against others, were not compatible or did not account for other dependent projects and organizations. Plus, there was no common vision of the product in the first place which would have given every team a direction of the journey. When you asked 3 or 4 teams about the vision of the product and project you got 3-4 different answers. Productive teams were moving into different directions. Energy and effort were wasted. At the end of the day, project objectives were achieved. The product launch was successful. However, overall spent effort was much greater than principally possible and originally thought. Consequently, team morale and confidence in agile product development approaches were at fairly low levels. This need not be the case. When you choose an agile approach to product development the first and foremost thing you have to ensure at the very beginning of your endeavor is making sure that people and organizations involved in this project have the same vision and share the same values. In other words, invest time with your teams to develop this vision and let them share it with others. Developing a project or product vision which works requires involving all key parties that will actively work on and in your project. This process may be time-consuming. But it pays off. If you cut it short for short-term gains, chances are you will have to pay the bill in the form of greater effort toward the end of your project. We all thrive for success. The big question is, how do we get there? I have provided a number of answers to this question in my book “Leadership Principles for Project Success“. More and more people are applying the 5 leadership principles laid out in this book. This is great as more people will experience how to ensure project success through leadership. Now Rod Collins wrote the latest book review on Amazon by Rod Collins. 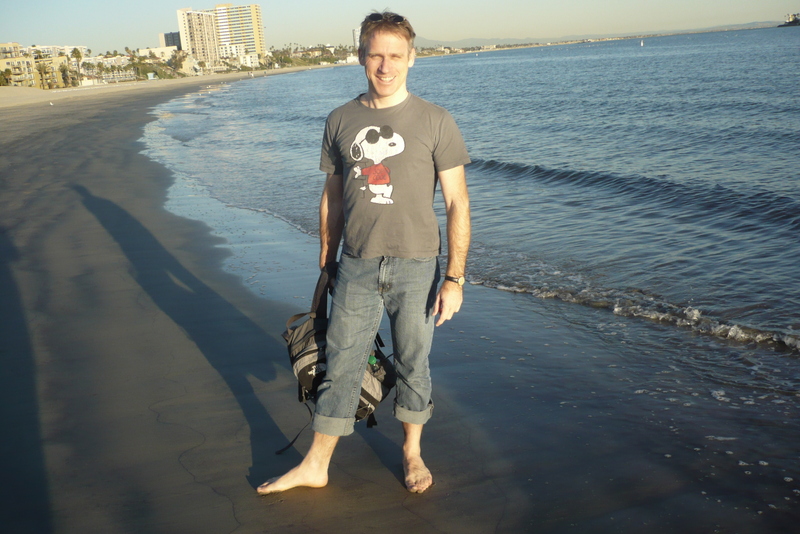 Rod is the author of “Leadership in a Wiki World” and the owner of Wiki-Management, a company that helps companies dramatically increase their performance. As the former Chief Operating Executive of the largest health insurance business alliance in the U. S., he pioneered an innovative management discipline that produced unprecedented operational and financial performance. His company’s website is www.wiki-management.com. Today is the second day of the PMI Global Congress EMEA 2011 in Dublin. More than 800 people came to Dublin to share their stories about project management and get inspired by new ideas. A fabulous event! My own presentation “The Good and Evil of Collaboration Tools” went very well I think and was well received. I will uploaded the final version of my presentation tomorrow to Slideshare. Stay tuned for more. In the meantime I have started a new discussion on the LinkedIn Group of the Congress. It is entitled “Can baselining and agile go together? I think this may be possible. Actually, I believe that baselining has to incorporate agile elements, otherwise it is doomed to fail. ” If you are on LinkedIn, join the discussion at http://lnkd.in/x9g_Gq.